Hope's Cafe: Education Outdoors Games- Review and Giveaway! Wow, now there's a mission I wholeheartedly agree with! And a new game would make the perfect gift for your child! Our family loves to play games together, and Education Outdoors graciously sent me one each of their games to review. First we tried the Camp Board Game. This game is unique in that you can have different levels/ages playing at the same time, and it's fair for everyone. How? Because there are 4 levels of questions in the game-from easy to difficult. So, as your child grows, and expands their knowledge, they can advance to higher level questions! And parents and children can play together; I love that! We had a lot of fun with this game, and I found the questions/answers very neat. I'm the type of person that likes to learn things just...well...to learn them! So, I really enjoyed learning some things I didn't know about the great outdoors. The decoder...M's favorite part of the game! The Snipe Hunt game is very unique and fun as well. Who hasn't heard of "Snipe Hunts" before?! You know, city boy visits the country, (usually snobby, making fun of the country boys). So, country boys decide to have some fun, and take him on a snipe hunting trip. Only...there is no such animal as a snipe! Well, now there is, and you and your family can enjoy snipe hunting! The "snipes" are really cute, and when removed from their nest, they start chirping and their eyes light up. This game is basically played like Capture the Flag, in that the two teams are racing to find the opposing team's snipe first. A lot of fun, and I like that it can be played outside or inside! My little sisters had a lot of fun with the S'mores card game. In this game, players have to collect the 4 necessary ingredients for s'mores-marshmallow, chocolate and 2 graham crackers. But, that's not all-you get higher points for having a perfect marshmallow, than if you have a burnt marshmallow!! Players get to draw, discard, and try to collect the perfect ingredients for a perfect s'more. There are also bonus point cards, such as a perfect fire, broken stick, etc. that help boost your points. This is a lot of fun! Education Outdoors is giving 3 of my readers the chance to win a game! The first place winner gets to pick which game they would like (Camp Board Game, S'mores Card Game or Snipe Hunt), 2nd place gets to choose from the remaining 2, and 3rd place gets the 3rd game! 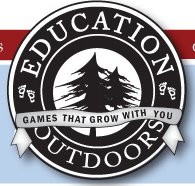 Go to Education Outdoors store locator, and tell me where the closest location is you can buy an Education Outdoors game! This giveaway ends Wednesday, November 3, 2010 at 11:59 p.m. Please leave a valid email address in each comment, as this is how the winner will be notified. Winner will have 48 hours to respond, or another winner will be chosen. Giveaway open to US residents only. Disclaimer:I was not monetarily compensated in any way for this review. I did receive product for the purpose of review. All thoughts and opinions are mine. All quotes taken from the Education Outdoors website. The closet place is The Learning Post in Urbandale, IA. Such unique games! I really like them. There are no locations within 50 miles of me that carry these products:( So I would love to win them on here. Thanks! I entered your Pureology giveaway. I entered your MyTwinn giveaway. I entered your Christa Taylor giveaway. I also entered your Bonita J. giveaway. I follow via GFC 1!